Hello from crazy town. My brain is 100% mush right now. There are so many things that it's trying to keep up with and it's deflating because of it. I'm not sure myself and my husband have ever had so much on our plates. Scott's plate is way more full than mine and I feel sorry for him at times. My plate is just overflowing a little and I'm on the struggle bus. I cannot wait until we finish this house and get moved in so I can just breathe. I'm definitely not complaining. I'm excited about all that's going on and we're having a lot of fun with it. It's just a lot and I'm ready for it to be complete and finished so I can just take a rest. If all the stars line up and everything is smooth sailing from this point forward, we will move into our house two weeks from today. We need zero rain days for this to happen. Has anyone ever known it to rain so much in January and February? 2018 has to have already set some kind of record for rain. They finally finished bricking our house today. It took so. long. to happen. If it wasn't raining, it was freezing. You can't brick in rain and you can't brick when it's below freezing. There have been about 14 total working days in the last three months that we've had decent weather. Now we need good weather for concrete. No one in Northwest Arkansas is checking the weather app as frequently as Scott and I are right now. This week is looking good so far. Hope it keeps up!! Speaking of rain, we got Bennett some Hunter boots over the weekend. It has rained so much and he doesn't have any appropriate shoes to wear when it rains. I got Campbell his Hunter boots about a year and a half ago. I found them at a discount store for a steal. They were 2 sizes too big but they worked and a year and a half later they still fit with a little room to grow. I have been so surprised at how much use Campbell has gotten out of these boots. He loves them and wears them all the time. Rain, snow, super cold weather....these boots are great. 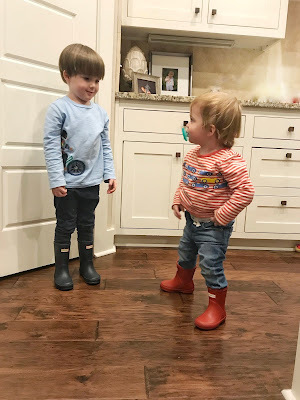 I had always just planned to wait until Campbell grew out of his boots to hand them down to Bennett and get Campbell some new ones. But it's rained so much and since Campbell still has a few months left in his boots I decided to just get some new ones for Bennett. I'm super sad I didn't do this sooner. He has the smallest size they offer and they are just about the cutest little rain boots my eyes have ever seen. We decided to be bold and go for red because why not? They're adorable. Get some for your little one. You won't regret it!